Any PR will tell you no two days are ever the same. So when Clarion floated the idea to our client De’Longhi to get involved with the first ever UK Coffee Week by taking freshly brewed coffee to radio DJs across London, I thought nothing of it. In fact, it turned out to be one of the most random, hilarious and downright exhausting PR experiences I’ve ever had – although I can happily state that the activity was a huge success and delivered us one very happy client. We started by taking an original 1967 Italian Fiat 500 Van – to communicate the brand’s Italian heritage – re-spraying it De’Longhi blue, and then pimping our new ride by putting a fully working De’Longhi coffee machine in the back, along with a working fridge and serving station. After throwing in some branded take-away coffee cups, plenty of brown sugar and 30 litres of water, we were ready to take our much-loved radio DJs their early morning caffeine fixes. Now, a 2am wake-up call across three days would have been enough to drive anyone mad (geddit?) – but the experience that would ensue literally had me doubled-over in pain from the laughing. As well as crying. Little had we realised while planning everything from our warm and cosy office that a vintage car would have no heating – unless you count the hot water bottle tucked under my coat. And no seat belts, apart from a reassuring flexible plastic loop fixed into the roof. However, it did come fully-equipped with suicide doors if it all became too much. So at 3.30am on Day #1 of UK Coffee Week, we pootled out into the London night from our safe lock-up in East London raring to go, only to be thwarted by the very first speed bump we came to. The car stalled. Not to be put off at the first hurdle (literally), further embarrassment was added to our journey from being overtaken by several cyclists, being jokily jeered at by those oh-so-forgiving white van men, and flashed at by London’s black cab drivers for driving so slowly. However, once we arrived at our various destinations, the buzz the “van with the actual working coffee machine” caused amongst DJs, newsreaders and production crews was totally worth it. People were coming down from their snug warm offices in the rain to see it, including Magic FM’s lovely newsreader Verity Gere, who mentioned us on-air. Celebrity DJs Lisa Snowdon at Capital and Dave Berry at xfm welcomed their hot cup of coffee on their way into the studio, and Lisa’s Capital breakfast co-host Johnny Vaughan was completely smitten with the van. He did try to convince us that our 1967 model had cruise control and even dived into the front seat to help us ‘find’ the lever that activated it. After an unfruitful search, he joined us for a cigarette and a coffee before heading inside where he and Lisa recorded a very special, tongue-in-cheek shout out for De’Longhi and our coffee van. Not only was the van – and the free coffee – a hit with the radio stations, we also had policemen and tourists alike wanting a look and to have their photo taken with it. 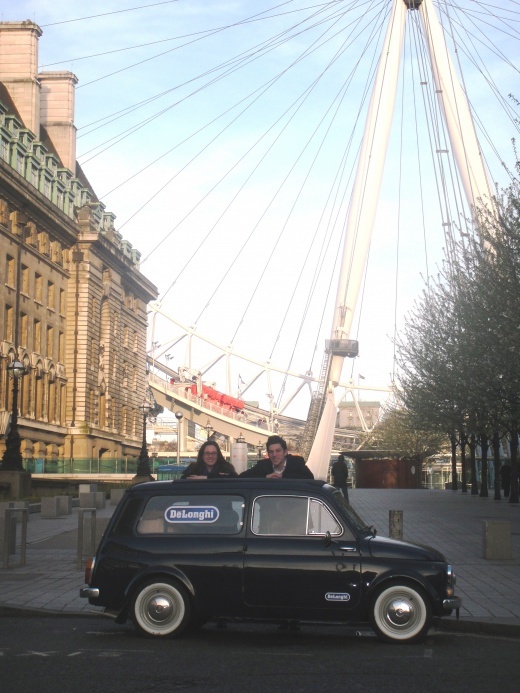 When we parked to get some artistic photos of the van in front of the London Eye, one crazy driver even stopped his car right in the middle of the Embankment during the morning rush-hour to ask us questions about it. Despite quite possibly being the most tired PRO by the end of our three days of coffee drops, the campaign was incredibly successful. Mentions included Magic, LBC, Kiss and LBC News as well as a private recording sent over to us from Johnny and Lisa at Capital. We’ve proven that with a creative, tangible idea and a well implemented plan, your average ‘radio drop’ can turn into something that not only provides a PRO with a good ‘not your average day in the office’ story, but also a very successful activity that creates excitement, talkability and more importantly, results, on a dreary early morning.